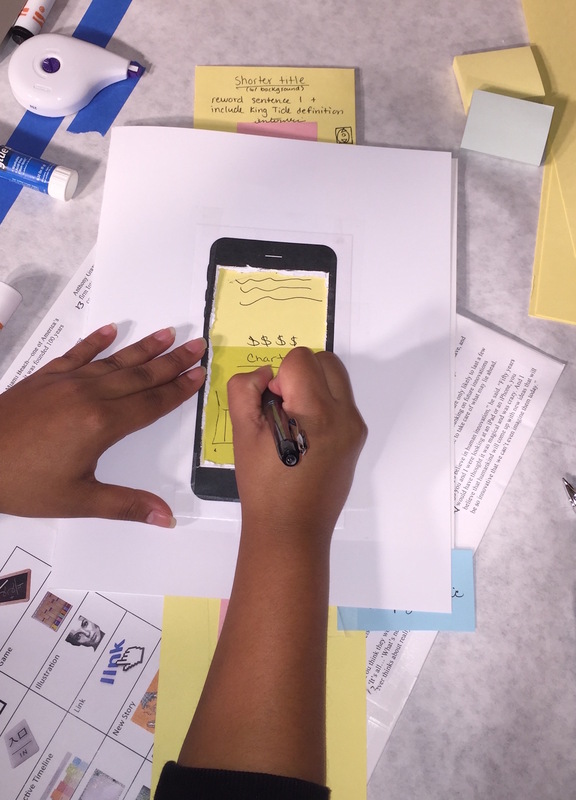 Paper and a cut-out of the iPhone 6 Plus combine to create an experience of paper prototyping for students to design long-form media for mobile devices. Illustration and photos by Robert Gutsche, Jr. This article was written in collaboration with Susan Jacobson and Jacqueline Marino. It had been years since Alexa Jane used markers, tape, scissors and pens to make something. Today, though, she and others are taking to cardstock and paper, taping and drawing to discuss the next generation of mobile news. “I prefer to have the hands-on… I don’t even remember the last time I was that crafty.” - Alex Jane, Digital Media Studies major, Florida International University. Audience Analysis undergraduate students at Florida International University pilot a session of paper prototyping for funded research into audience interest in long-form multimedia journalism. by Robert Gutsche, Jr.
Jane and her team construct screens and designs for interactive graphics to insert into a folder with a spot cut to the actual size of an iPhone 6 Plus. By cutting and pasting text and interactive elements on long, narrow strips of paper, the students work to transfer a long-form style article about rising sea levels in South Florida from the laptop to the mobile screen. This is paper prototyping – a method of using Post-its, pens and imagination to design features of interactive media. 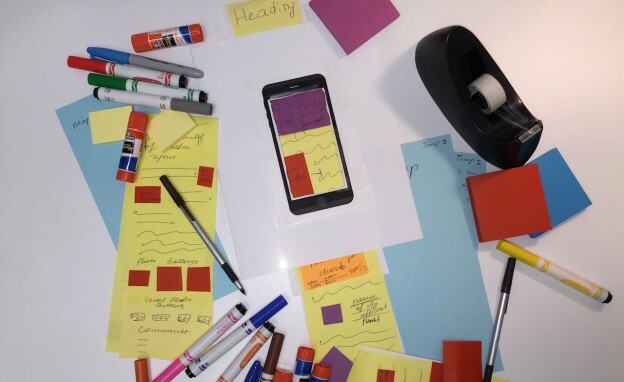 A cut-out of an iPhone 6 Plus takes center stage in prototyping where students use paper to create new features and screens for a web-based long-form project that they redesign for mobile use. Photo by Robert Gutsche, Jr.
Used throughout the professional world to varying degrees and with a variety of alterations of the method, paper prototyping engages journalists and media users with thinking about design, interactivity and functionality of new formats and platforms. The prototyping these students are doing is a pilot for part of a research project led by three Research Scholars at the Donald W. Reynolds Journalism Institute at the University of Missouri. Building upon an article about digital long-form journalism published in the journal Journalism, the project engages students and media users from communities in Ohio and Florida in ways that explore the degree to which long-form multimedia journalism is desired by audiences. It also looks at how the form may be molded for mobile audiences or altered to become a sustainable form of journalism for large and small media outlets. In the process of preparing for this project, we challenge the role of funded research in the classroom, the value of qualitative methods in audience studies of journalism, and the influence of social and cultural approaches to complicate both the field of Journalism Studies and students’ classroom experiences. Starting this summer at Kent State University’s IdeaBase, Jacqueline Marino has been using with eye-tracking to see how users interact with long-form projects, such as the Guardian’s Firestorm and rue89.com’s piece on Haiti on iPads. 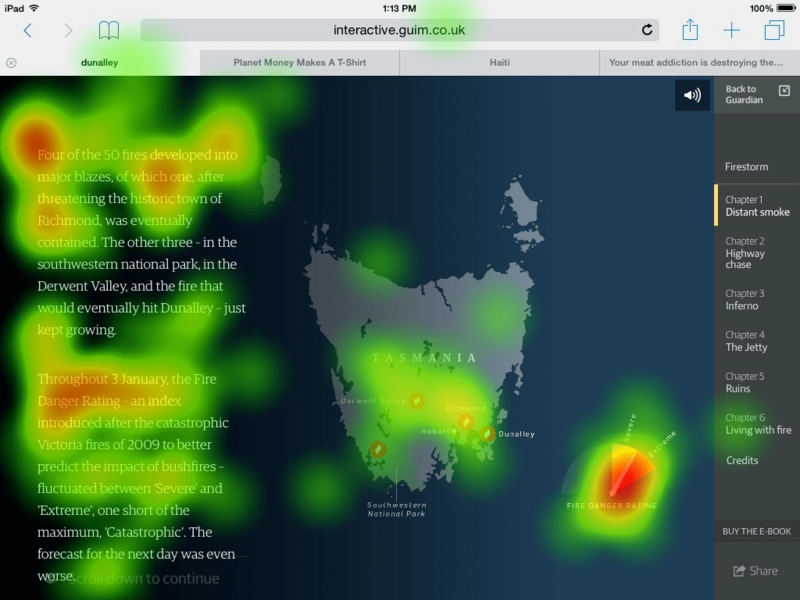 A heat map from eye-tracking done at Kent State University shows where users focus their attention on The Guardian’s Firestorm multimedia project. Image captured by Jacqueline Marino. Participants in that study have been reading long-form projects while wearing Tobii 2 glasses. Marino is analyzing the data collected by software that measures what types of content the participants view and for how long. When combined with other forms of inquiry that are part of our project, we can surmise as to what attracts and maintains audience attention in long-form journalism. As part of funded research from the Donald W. Reynolds Journalism Institute, researchers use eyetracking to examine audience interactions with long-form journalism. Video courtesy of Tobii. 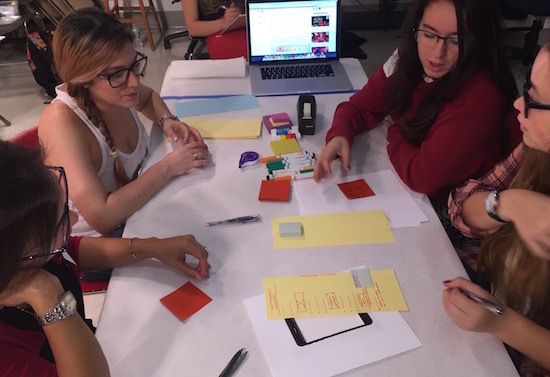 This semester, researchers at FIU are finishing up a second round of focus groups with paper prototyping that have participants design long-form projects for mobile devices. An earlier set of focus groups asked participants to describe how they liked viewing content on both laptops and mobile screens. Also this semester at FIU, Susan Jacobson is examining the step-by-step experience of users who view online apps, including an interactive map related to sea level rise designed by students and faculty here last year. These opportunities provide students with further insight into the research role of many faculty and universities and the purpose of research to better the industry. Additionally, these funded opportunities not only contribute to new knowledge and innovation by bringing much-needed public and private funding into classrooms in ways that shape courses and student experiences. True innovation in the classroom, though, appears in the convergence of engagement, practice, and theory. 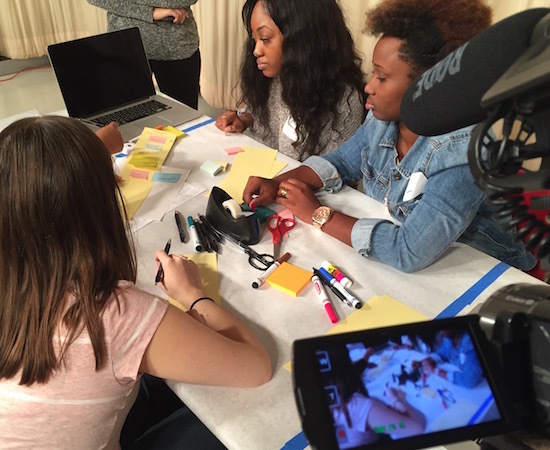 Paper prototyping in a course on Audience Analysis introduces students to issues and challenges of funded research, qualitative methods, and cultural approaches to media studies. by Robert Gutsche, Jr. In an age ruled by analytics, media classrooms must continue (or, in some cases, begin) to embed student experiences with critical/cultural interpretations of production, content and audiences. Students interacting with concepts of long-form journalism through this experience are also introduced to cultural interpretations of media symbols, social and cultural messaging through literary forms, and participatory methodologies. By reading Nightingale’s “The Handbook of Media Audiences,” students were able to join classroom experiences that combine theory and practice, such as scenario planning, cultural examination of news, and community-based journalism. In what ways do we assess students’ interactions with research? Is there a need for new rubrics to measure learning related to the intersection of theory and practice? How do we bridge the time lapse of research? Students tend to move on from courses – and even some programs – before research is completed and published. What must journalism programs do to blend and apply research more into skills classes or vice versa? Feel free to comment below to help drive the conversation. FIU journalism major Jessica Fuentes contributed reporting to this post. Robert Gutsche Jr. is an assistant professor at Florida International University’s School of Journalism and Mass Communication. Susan Jacobson is also an assistant professor at FIU’s School of Journalism and Mass Communication. Jacqueline Marino is an associate professor at Kent State University School of Journalism and Mass Communication.